In late November and early December before snow comes to transform the land, the garden seems dull and boring. 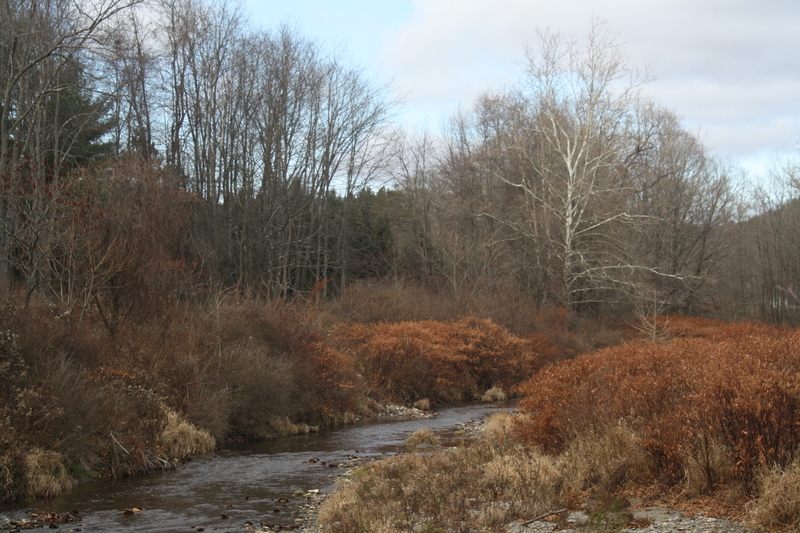 Almost everything has died down to various shades of brown, from tan to rust to near black or gray. Evergreens provide splashes of relief to the eye, but even they begin to darken or turn a more yellow shade of green as the cold sets in. 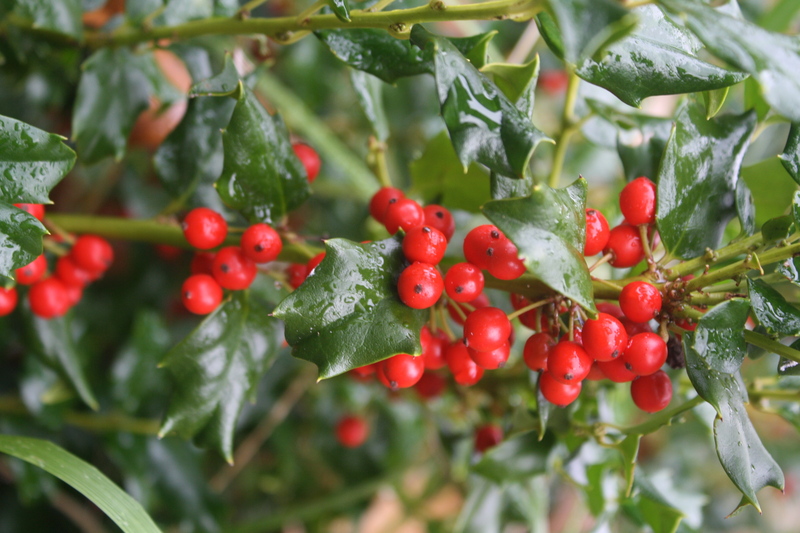 Berries, particularly hollies and winterberry, cheer the heart with bright crimson that stands out in such a desolate landscape. I find myself looking for evidence that life is continuing albeit at a slower pace. 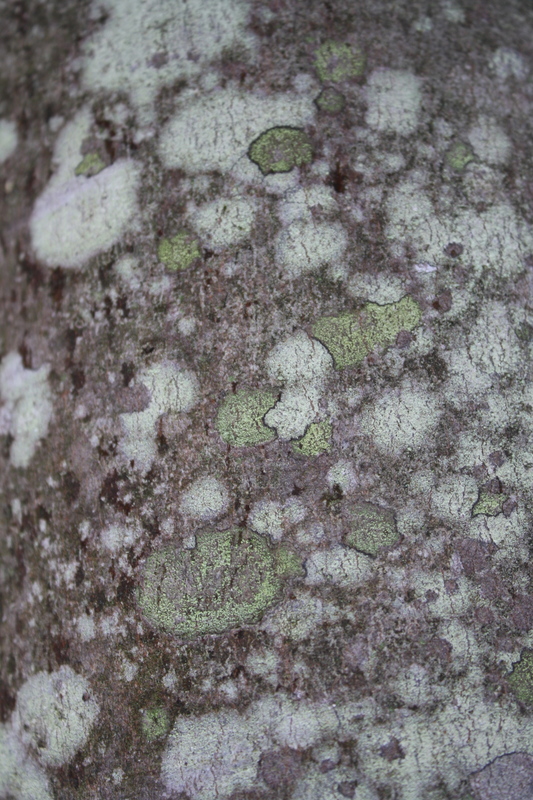 Lichen and moss create mosaic patterns on tree trunks and lacy reindeer moss cling to the bark on branches of the spruce trees. The pines whir and sigh as the wind passes through their needles and chickadees search their high boughs for insects. 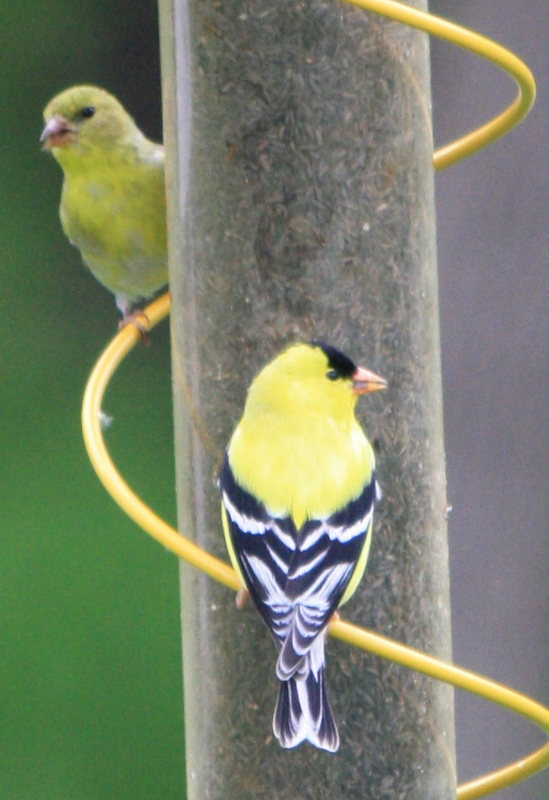 Sometimes I stand at the kitchen window and watch the birds at the feeders just to be reminded that nature is moving on regardless of the temperature. The colder it is the more actively they feed. Cardinals, thus far this year there seems to be only one pair, are the first to come and last to leave, their dim forms moving from ground to branch in the twilight at the beginning and end of each day. 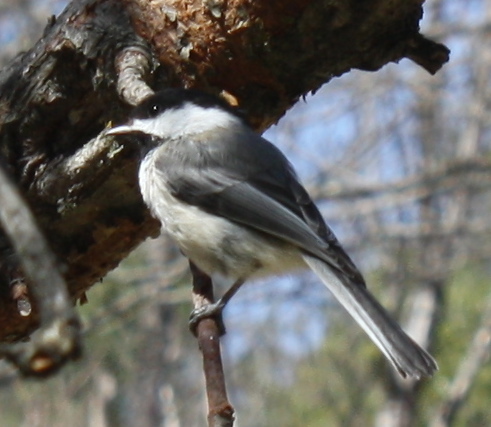 Chickadees and titmice are the most polite, taking a seed and flying to a branch to eat it, while goldfinches just park themselves at a station and gorge until someone pushes them off. 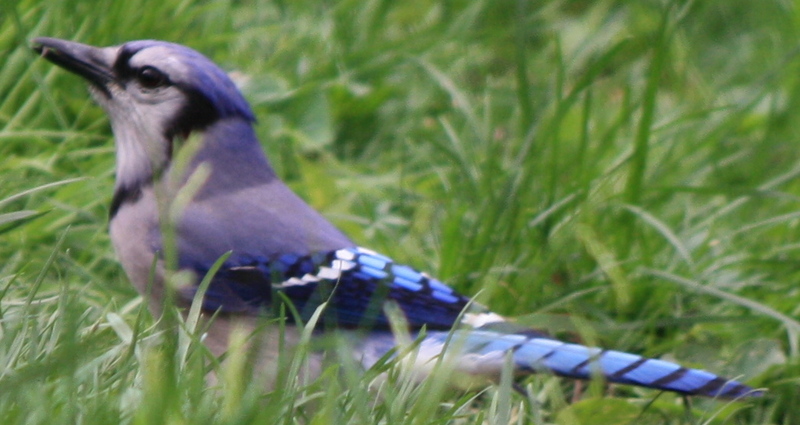 Of course, the real bullies are the blue jays, whose arrival, accompanied by a harsh screech, scatters all the smaller birds. I usually forgive them their dominance for their color is truly beautiful. Depending on the light, they can be brilliant azure or grayish lavender. Their bright eyes and jaunty hop bespeak an intelligence that misses nothing. I often put out crushed eggshells, as they seem to crave more calcium then the other birds. Chickadees, I find quite cheering. As they flit from branch to branch overhead, their high-pitched ‘sweet’ and inquiring ‘chick-a-DEE-DEE?’ filters down as I watch from below. They are fearless, and sometimes reckless, with how close they come to danger when feeding. They are the only bird here that will feed alongside a blue jay. When I am filling the birdfeeder they can barely wait for me to finish, swooping down to perch and grab a seed while I am still standing there. My sister long ago trained them to eat from her outstretched palm, but I have never been patient enough to stand in the cold, nose and toes numb, waiting for them to come. Perhaps I should try it as a meditation; I’m getting less restless as I get older, not as eager to do the next thing, savoring instead the present moment. Maybe I can learn a thing or two from the birds. 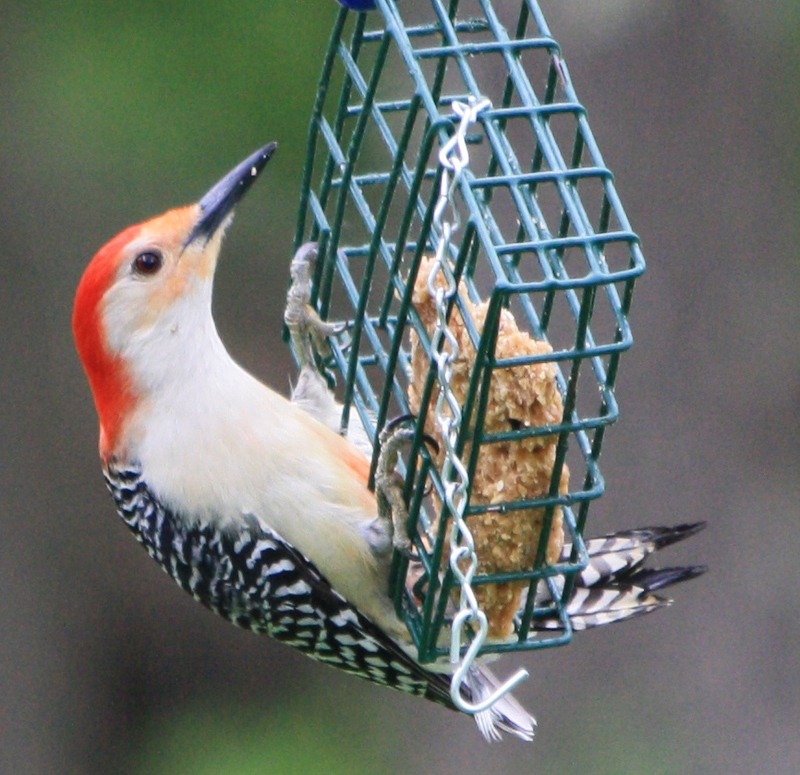 For more information on feeding birds check out Cornell’s Project FeederWatch. This entry was posted in Country Gardening, Field Notes, My Photos and tagged berries, Bird feeder, birdfeeder, birds, blue jay, chickadee, color, Dormancy, evergreens, FeederWatch, Garden, goldfinch, holly, landscape, pine, winterberry, woodpecker. Bookmark the permalink. I feel inspired by your passion and joy with nature. It is so very life affirming (and calming 🙂 ).